A taco dream come true: crispy, light-as-air fried fish, balanced by a creamy slaw and fiery, cooling, and crunchy fixings. Whisk all-purpose flour, rice flour, and salt in a medium bowl. Gradually whisk in club soda until no lumps remain; adjust with more club soda or rice flour as needed to make it the consistency of thin pancake batter—it should be pourable, but thick enough to coat the fish. Fit a large pot with a deep-fry thermometer and pour in oil to measure 2”. Heat over medium-high heat until thermometer registers 350°. Working in batches of 5–7 pieces at a time, coat fish in batter, letting excess drip off, then carefully place in oil (to avoid splattering, lower fish into oil pointing away from you). Don’t overcrowd the pot: The oil temperature will drop dramatically and fish may stick together. Fry fish, turning occasionally with a fish spatula or slotted spoon and maintaining oil temperature at 350°, until crust is puffed, crisp, and golden brown, about 5 minutes. Transfer to a wire rack set inside a rimmed baking sheet; season immediately with salt. 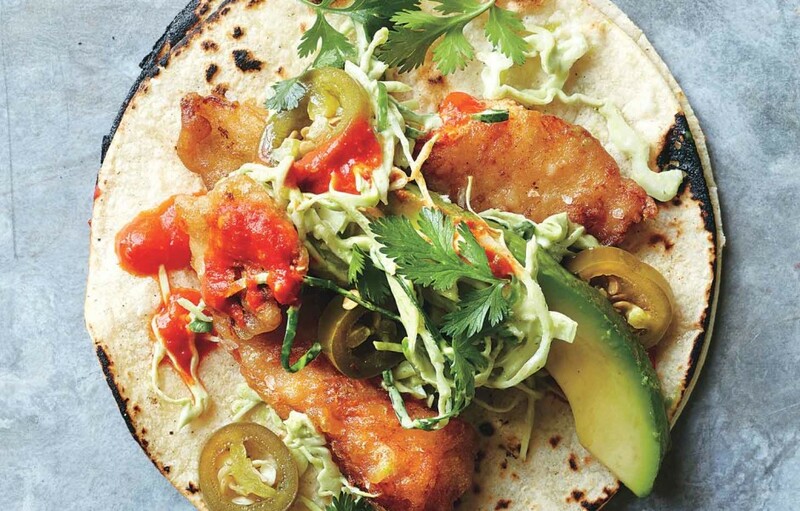 Top tortillas (we like two per taco) with fish, slaw, hot sauce, avocado, cilantro, and jalapeños. Serve with lime wedges. This post is really nice. Love the Fish Tacos. This is very delicious to look at. Thank you for the recipe and ingredients you share. Hope your next recipe will published soon.